Enable Invoicing enables the ability to create invoice records for approved time sheets and expense reports. 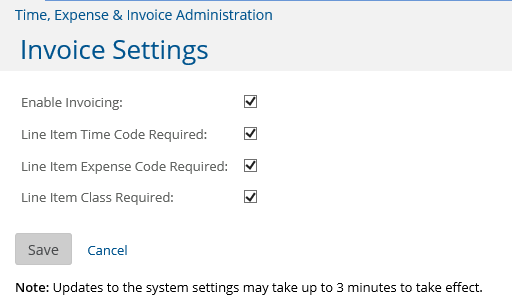 If this is checked on, then users with the Time/Expense/Invoice Manager role (User System Roles) will see an Invoice Records menu option will in the left navigation. For an overview of using the invoice records function, see Invoice Record - Details. Line Item Time Code required - Invoice records will have individual line items, that can be either "time" line items or "expense" line items. If they are for time, then a time code can be set for the line item. If this option is checked, then a time code always must be set for every time line item. If its not checked, then entering a time code is optional. Line Item Expense Code required - If a line item is an expense, then an expense code can be set for the line item. If this option is checked, then an expense code must always be set for every expense line item. If its not checked, then entering an expense code is optional. Line Item Class Required - Each invoice line item may have a Classification assigned to it (regardless of whether its an expense or time line item type). Invoice Classification types are set in the Administration section, Invoice ClassificationsIf this option is checked, then an invoice classification code must always be set for every line item. If its not checked, then entering a classification is optional.